Love, Lenore: what I wore: floral + high-waisted shorts. what I wore: floral + high-waisted shorts. Shorts: Forever 21 (I bought these last year, but here is a somewhat similar pair). Strapless top: Lilu from PacSun (no longer available). 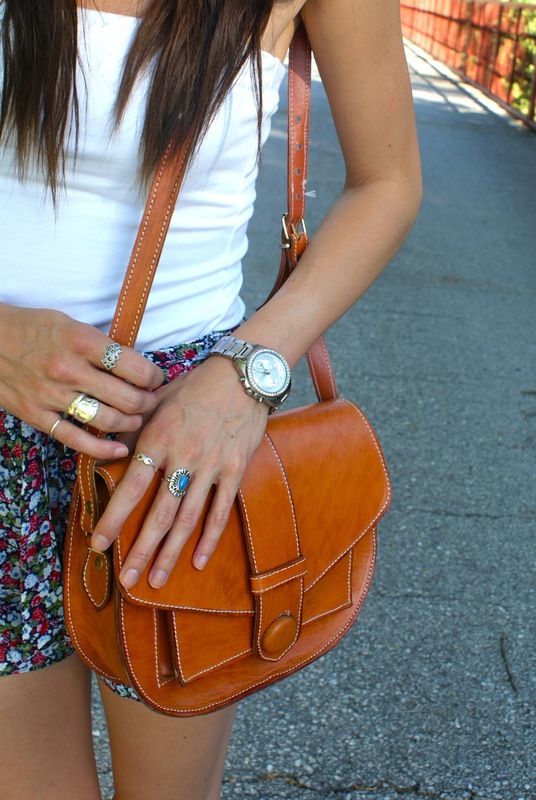 Brown purse: vintage. Wedges: Steve Madden (no longer available). Watch: Fossil (similar here). Rings: vintage & gifted. My friend and roommate Ashley snapped these photos before we went out to dinner and watched the NBA Finals last night...and fortunately we took the photos before I ate a giant, delicious burger! I've realized I need to show some of my more casual outfits a little more often, and love adding some flair and personality to even my casual looks! I adore these little floral high-waisted shorts I bought last summer, and felt that a strapless top kind of added to the slightly vintage feel of the shorts. I topped off the outfit with wedges (my current obsession) and Ashley's adorable vintage bag! Super easy and comfy, but way cuter than the basic denim shorts and a t-shirt! There are only a few days left of my beauty giveaway, so don't forget to enter here! I love this look, the shorts are fab for the summer! I haven't been to F21 in a while - reminded me that I need to go! lol. Great summer outfit! Love your shorts! Love your shorts! Perfect for summer! Thanks so much for your sweet comments! I'm following you too! Freaking cute as always! I want your face. It was love at the first sight between me and your outfit :) it's so cute!<3 I really like your blog and I'd like to see more of your looks. Would you like to follow each other? I'm your reader now here and in Bloglovin too! check out mine if you want to ! I love those shorts, super cute! Perfect for a relaxing day! Those wedges are amazeballs too!! the floral shorts are soooo cute. following u now :) follow me back if you like! the floral shorts are a must these summer, love them! Wish you a great week my dear! Amazing shorts, the cut and the print is gorgeous! loving the bag and the ring! its a true and wonderful summer look. you look incredible in this outfit! :) love the gorgeous print on those shorts! dear, you are so pretty!! This shorts are really gorg! !You have beautiful legs and I adore the while outfit! you are just too cute for words, girl! absolutely in love with your style! and that bag is just perfect!!!! Love those shorts, it's perfect for summer! Hi, this blog is really amazing and provide me answers to all my questions.. I usually spend hours on the net reading blogs on various subjects. And, I really would like to praise you for writing such a fabulous article.